I’ve been wondering when a game would make me cry, and that changed over the weekend. A few games have made me teary eyed, but that’s about it. That Dragon, Cancer not only made me weep, but I had to stop playing it a few times. I’m going to talk about some of the events that happen in That Dragon, Cancer. If you’d like to go into the game without any knowledge of what happens, stop reading now. Many of us are desperate for video games to tackle more serious subjects, and few are more serious than That Dragon, Cancer. It’s the story of Joel Green, a boy diagnosed with cancer at 12 months old. That Dragon, Cancer is about a family’s struggle with the inevitable, and what gives That Dragon, Cancer so much power is that it actually happened. The game’s story, which takes place over roughly two hours, is split into a series of moments from the Green family’s past few years. One is a conversation between Joel’s parents and the doctors, as they learn Joel’s cancer is terminal. Another has Joel’s father rocking him back and forth, hoping he’ll find peace in sleep. These moments slip between the reality and fantasy, as it looks for ways to express the complicated emotions the Greens were experiencing. That Dragon, Cancer opens near a lake, with players controlling a duck slowly inching towards a young boy at the shore. One bread crumb at a time, the duck moves closer. Soon, the camera switches behind the boy and people begin talking about him. This is Joel, and Joel is special. “He can’t talk,” says Joel’s brother. “That’s true,” says his father. “Two year olds can talk,” exclaims the brother, which his father confirms. Though the various scenes often take place in expansive environments, the player controls the game by looking around and clicking. This isn’t Gone Home—you aren’t meant to open every door, peek inside every drawer. This is a guided story; players merely determine its pacing. Sometimes, the game grants you more control. Other times, the game merely wants you to observe. While at PAX East with my wife, we stopped by the booth for That Dragon, Cancer. By the time someone had finished explaining the game’s premise, my wife was in tears and had to look away. By virtue of its subject matter, That Dragon, Cancer can prompt an emotional response before a pixel even appears. If you read Kotaku, chances are you view games as art, a debate that was settled long ago by the medium’s biggest fans, as we’ve simply been waiting for everyone else in the world to catch up. It’s hard to imagine skeptics being won over by the next Call of Duty, however, which is why games that delve outside the norm—something like Papers, Please—are celebrated for bucking trends. That Dragon, Cancer conceptually swings for the fences, proposing a video game was the way to express this nightmarish slice of reality. 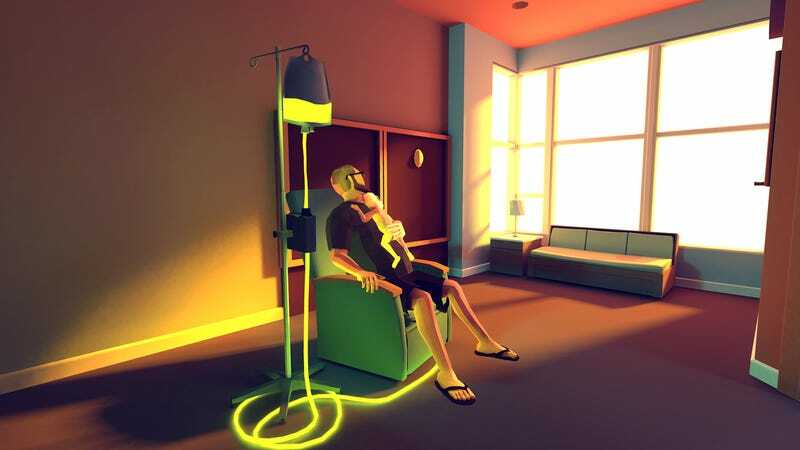 And while That Dragon, Cancer doesn’t always live up to that promise—a series of dream sequences visualizing Joel’s struggles don’t really work—the times it does suggest a medium of unexplored potential, with That Dragon, Cancer helping pave the road. One of them happens early on, and is the moment I mentioned earlier, wherein Joel’s parents learn there’s little hope for a cure. The news is followed by silence, and the player gains access to a “toy” emblazoned with the faces of everyone in the room: mother, father, doctor, assistant. By clicking each of the faces, the player can hear a line of dialogue from everyone in the room, hearing the raw emotions that often go unsaid. It works. Restrictions set by the game’s creators prevent me from showing you the game’s most powerful scenes, ones that had me rocking back and forth, before placing my head in my hands. (The developers are, understandably, trying to preserve some of their game’s biggest moments.) I wouldn’t want to show you them, either—That Dragon, Cancer works best when you’re the one playing. I want to be a dad someday. I’m looking forward to it. Knowing that, I almost avoided playing That Dragon, Cancer entirely. Why play a game that you know will emotionally destroy you? But I play sad games, watch sad movies, and read sad books because it reminds me that I’m alive. I didn’t used to be a person who cried. Maybe when my first girlfriend broke up with me? Then, out of the blue, my dad died of a heart attack over three years ago and everything changed. Life became real. Now, I’ll cry at the drop of a hat, including sappy TV commercials. That Dragon, Cancer is not sappy, and while it’s sad, it’s about hope. When I played That Dragon, Cancer, I thought about the people I loved—my wife, my dog, my possible sons and daughters. My dad. The game is two hours, and I don’t know thatI could have handled more, but for the time that I did, I’m glad I did. That Dragon, Cancer will be available tomorrow on Steam.